I’ve never been one to totally buy into the concept of destiny when it comes to how things went about happening in my life. But every once in a while, I think back to a specific moment and push aside my cynicism and accept that yeah, maybe there is something bigger going on that I have no control over. It’s silly to make these kinds of parallels when talking about a comic book, but that’s exactly what I’m going to do here. Back in the Fall of 1987, I was at my local corner store/candy store when I saw my older brother pick up a copy of Amazing Spider-Man, issue #296. With a dollar bill burning a hole in my pocket, I did what any 7-year-old who idolized his older brother would do, I picked up the same comic book. Not only was a collection born that day, but a relationship with a specific character and his universe – which included supporting characters that were good, evil, and shades in-between. Maybe you can debate the merits of destiny, but I counter those claims by asking what are the odds that the first comic book I ever picked up would feature a story pitting Spider-Man against one of his most classic villains of all-time? In fact, there are many people out there who would argue that Doctor Octopus is Spider-Man’s GREATEST villain of all-time, and while you can pick nits over how he matches up on the dastardly scale with the Green Goblin, the recent Ends of the Earth/Sinister Six storyline seems to striving to give Otto sole possession of “first place” again in that regard. A hero’s rogue gallery is as essential to the story as the hero himself. Perhaps if I picked up my first comic book a month earlier, which in the case of ASM, featured the “Life in the Mad Dog Ward” storyline – which pitted Peter against a bunch of doctors in an insane asylum – my interest in Spider-Man comic books would be passive at best today. What’s more fascinating for a 7-year-old child, a darkly comic story about a bunch of people who think a superhero is mentally insane, or a classic hero vs. bad guy battle between Spider-Man and a villain with four wildly-swinging mechanical arms? As it were, ASM #296 and #297 isn’t exactly the pinnacle of Doc Ock’s long-storied cat and mouse relationship with Spider-Man. 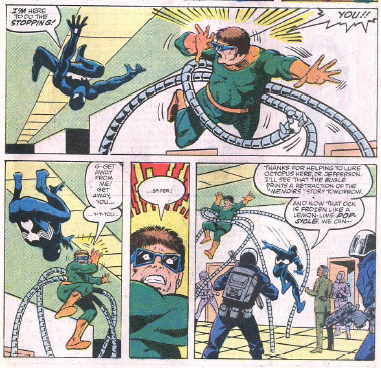 Surely if I was a child of the 1960s, and I picked up the “If this Be My Destiny” storyline, I would have witnessed, arguably, the greatest Doctor Octopus story. Or a decade later, I probably would have gotten a hoot out of the storyline where Otto tries to marry Peter’s Aunt May. 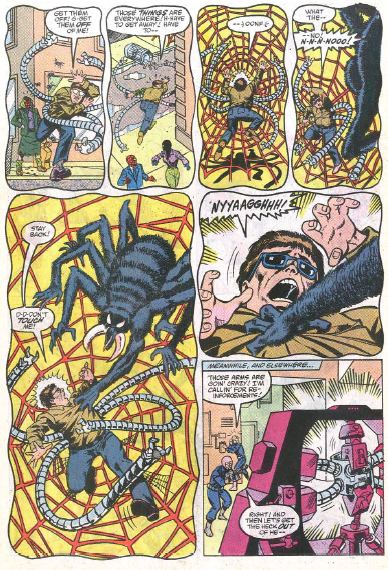 Instead, my first real exposure to Doctor Octopus was a storyline that featured him being deathly afraid of Spider-Man – not even being able to control his trademark mechanical arms because he became paralyzed with fear just by Spidey’s presence. 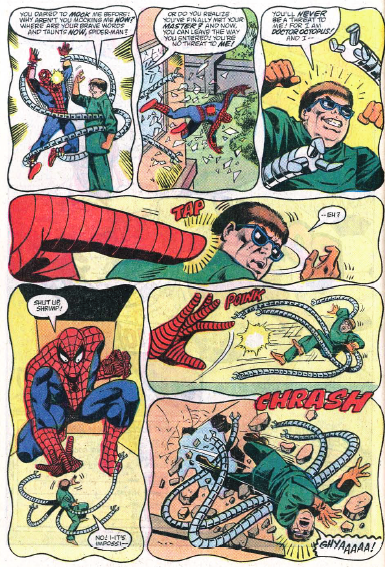 In order to save the world from certain destruction, Spider-Man has to allow Doc Ock to defeat him so Otto can get his mojo back. While it’s a storyline that certainly features a lot of what I would go on to love about Spider-Man – his selflessness and his self-deprecating sense of humor, this isn’t exactly Spider-Man lifting a ton of machinery off his shoulders in order to save his Aunt May. With all that said, this is physical version of Doctor Octopus I went on to mostly identify with for the rest of my life – the yellow gloves/boots and great suit, with the tinted glasses. There was something totally nerdy yet terrifying about the get-up and while Green Goblin has the artillery and Venom had the muscles, Ock was just a classic. In the 25 years that have passed since I bought that comic book, I still find myself inevitably disappointed when Ock makes a public appearance and he’s not in his “classic” costume. The trench coat mafia look from the Spider-Man 2 movie? No thank you. The pseudo-cyborg version of him that exists today? Not really. Give me the green and yellow Ock any day. And beyond just his costume, I’ve shared a subliminal connection to Ock ever since I first picked up that comic book. 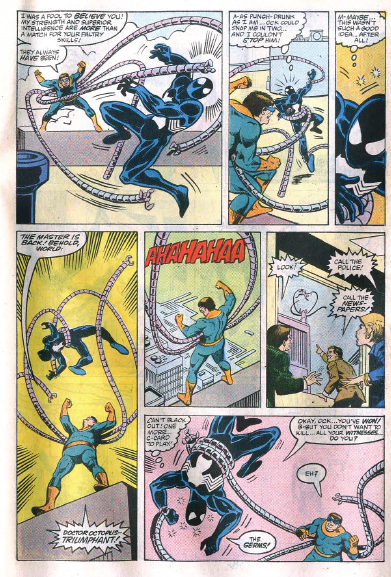 When I was a child, I used to refer to my pediatrician as “Doctor Octopus,” because what else would a first-grader call someone whose first name is introduced to him as “Doctor?” Years later, my anticipation always rises exponentially when Marvel teases a Otto appearance in a Spider-Man comic. Whereas it seems like Norman Osborn has been EVERYWHERE since returning from the dead in the 1990s, Marvel has been incredibly smart about its use of Ock, seemingly busting him out for special occasions and anniversary issues. I’m hoping once I’m a few issues into Ends of the Earth, tradition won’t be bucked. Cool, man. The first comic I bought off the newsstand was Marvel Tales #71 that reprinted the fateful Amazing Spider-Man #90, also with Doctor Octopus. After that, I got hooked on Marvel. If this be my destiny is NOT a Doc Ock story…..